Jacques Audiard’s misbegotten Palme D’Or winner Dheepan aspires to be a Taxi Driver for today’s Europe, but ends up as a crude cross between Death Wish and Ken Loach. It starts promisingly enough, with three complete strangers escaping a Tamil refugee camp in Sri Lanka by posing as a family, only to wind up at a gang-run housing project on the outskirts of Paris. But this unconventional family drama turns out to be a front. Audiard (A Prophet, The Beat That My Heart Skipped) has found success in translating the self-destructive male loners of 1970s American film into present-day France, but here, it comes across as laughable instead of troubling, mustering only a fraction of its Stateside forebears’ momentum and style. Dheepan’s loner is a Tamil Tiger who has escaped the repercussions of being on the losing side of Sri Lanka’s civil war by adopting the identity of a dead man. 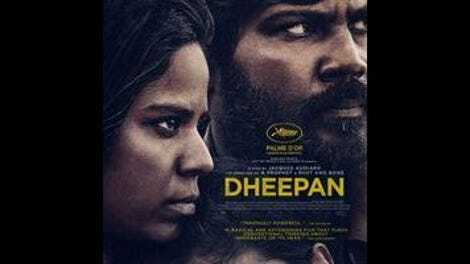 Now calling himself Dheepan (Antonythasan Jesuthasan), he is relocated to France alongside a young woman posing as Dheepan’s wife, Yalini (Kalieaswari Srinivasan), and a random orphan who’s been given the identity of the couple’s daughter, Illayaal (Claudine Vinasithamby). Eventually, they end up in public housing, where Dheepan works as a groundskeeper while Yalini gets a job looking after a disabled former drug lord whose apartment doubles as an office and conference room for local gangs. Given credibility by its three non-professional leads, Dheepan’s opening stretch follows the fake family as they adjust to their new lives and identities. Audiard is attentive to the tricky circumnavigation of legal boundaries involved in entering a society from the bottom, and Jesusthasan and Srinivasan are compelling as strangers forced to play parents to a 9-year-old girl while also trying to keep a low profile. This is the immigrant story as spy fiction, complete with cover stories, falsified passports, and internal conflicts about the “mission.” While Yalini takes to wearing a scarf in order to fit in with the housing project’s largely Muslim population, Dheepan can’t seem to shake his wartime past. The movie’s early cornball flourishes (e.g., a slow-motion sequence set to Vivaldi) turn out to be signs of things to come. Ramping up the threat of the drug dealers with the arrival of a new gang leader (Vincent Rottiers), Dheepan succumbs to the idea that the suburbs of Paris are just another war zone, replicating Taxi Driver’s violent climax and disquietingly upbeat coda, without a hint of the insight the earlier film offers into Travis Bickle. The Martin Scorsese and James Toback movies that Audiard has built his career on imitating (or just remaking, in the case of The Beat That My Heart Skipped) often risk ridicule. But they do it with a swagger and energy that Dheepan sorely lacks. Cinematographer Éponine Momenceau’s sloppy camerawork and muddy lighting are passable as long as the movie is focused on people talking in barely furnished apartments, but not once Dheepan shifts gears into an artless, ambiguously reactionary action fantasy of improvised weapons and bad guys getting what’s coming to them. Audiard’s conception of modern France as a place so bad that even civil-war refugees would want to escape it is boneheaded; depending on the viewer, it either betrays everything that makes the movie’s perspective and makeshift family dynamic interesting, or cancels it out completely.